Do you think Family Friendly Gaming gets everything we ask for? Let this be a teachable moment. FFG requested a physical copy of Return to PopoLoCrois A Story of Seasons Fairytale just like all of the retail chains receive, and what has been given to media outlets for decades. FFG was provided a digital download code that clocked in over 1.5 gigs. Half a gig over the limit, and it brought us right up to the brink of having to pay an Internet overage usage fine. 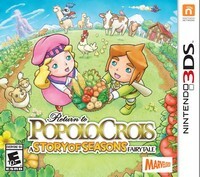 Thankfully there is a physical copy of PopoLoCrois A Story of Seasons Fairytale available at retailers. I have put PopoLoCrois A Story of Seasons Fairytale on the list to purchase a physical copy when it comes down to twenty dollars. There is not enough room on the memory card to keep a game this large. Supporters of digital downloads rarely enjoy talking about that reality. As well as moving the distribution costs onto consumers. The intro in PopoLoCrois A Story of Seasons Fairytale is nice. This game starts out like the old Popolocrois video game. It takes an hour or so to get to the farming part. This is where PopoLoCrois A Story of Seasons Fairytale shows itself to be a hybrid of the SRPG Popolocrois, and the farming simulator of A Story of Seasons. The mix feels strange, especially when we are on a quest and a message pops up that produce is ready on our farm. The bad content parents will want to be aware of in PopoLoCrois A Story of Seasons Fairytale is witches, devils, violence, bad language, magic, a World Tree, false goddess, fairies, enticement to lust, and more. Players can be shrunk to go into dungeons to cleanse the land. Much of the land in this place has been infested with some kind of evil blackness. There are even black beasts to fight in this hand held video game. The music in PopoLoCrois A Story of Seasons Fairytale is cool, and the voice acting is decent. The turn based battles are pretty simplistic. Move toward the enemies and attack them. Defeat them all and collect gold and experience. The saves are too far apart. There is a quick save option in PopoLoCrois A Story of Seasons Fairytale. Not sure why it is not a regular save. Players go on a quest in PopoLoCrois A Story of Seasons Fairytale to cleanse the land of evil, and restore the four farms of light. The prince has been magically teleported to this land, and wants to get back to his home, and his family. In some ways the farming seems to be tacked onto a Popolocrois video game. PopoLoCrois A Story of Seasons Fairytale reminds me of Rune Factory in some ways. There are definitely differences between the two though.